This morning while getting into the mood of starting a new day at work by doing the usual of checking facebook news feed to find some interesting stuffs to read, I chance upon this; Why I have a Bucket List. Now you guys know about my paranoid view on Death and anything that has to do with it. A post about a list to do before you die???? Yikes! My usual reaction would be to make a quick twitch of my finger to scroll up the page. Well, not today. That finger seems to have a mind of its own, defying the signal sent by my brain to do so, it decided that it's time I take a step forward and faces my taboo topic as it put pressure on the mouse's button and brings me to Verna's post. Her inspiring post makes me want to make a Bucket List too. I've never done this before, it sounded and looked easy but I am stumped and clueless what to do at the moment. What IS a Bucket List? I asked the good ol' Google and it came up with this. O-kay, so a list of things to do before I errm... go over to the other side??? I like this explanation better. Now that makes it looks like a cool and fun idea~ What shall my Bucket List be? I have so many things that I want to do, some can be easily achieved and some have little hope of accomplishing it; like owning a property on a remote island hahaha~ I shall keep mine simple and achievable since I am doing it for the first time, my list will probably include things for the family and me which I hope will be ticked off by end 2014. And since its no fun doing this alone, I plan to start a linky party for this and I invite all of you to join me! If you already have a Bucket List of any sort, please link up when it goes live. If you do not have then start making one now, it can be for places to go for holiday, life focusing issues, things to do on Christmas and/or New Year, list of books to read, goals or dreams, desires, going on a diet, before I turn 30/40/50/60 etc... anything that you fancy. The party will go live anytime on week 21 October 2013, so get your list ready! 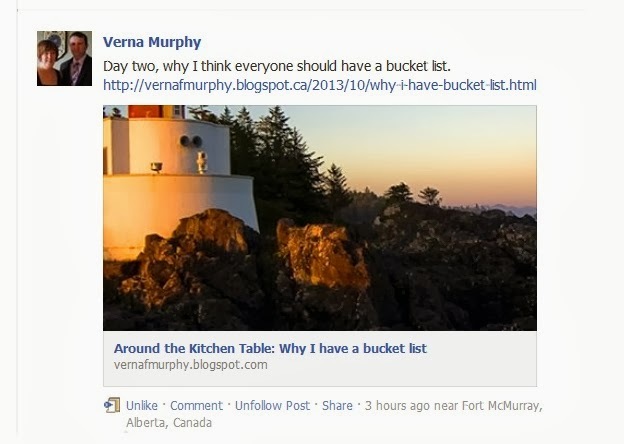 I have taken the follow 2 quotes from Verna's post because I like them a lot and with that I shall think of my Bucket List. NOTE : I have to add this after a friend mentioned that she is sick and feels like dying after reading my post. I am truly sorry to hear that. I am not trying to make any one or every one depressed or in my friend's case, feels like dying. It is not a real bucket as in "kick the bucket" Bucket List, this is a fun list where you pick a theme/goal and list down the things that you want to do to achieve with a span of time such as a few months, a year or a few years. For example there is a Summer/Fall Bucket List where parents set out a list of things to do during Summer/Fall time. Or a Holiday Bucket List where a few places or countries are listed and visited in a course of time. I hope I have made myself clear and no one is going to feels like dying any more. Hehe. I'm clinging to my final years. There is so much more to accomplish. Now sure I want to write a list though. Perhaps it would help the younger generation sort out their priorities. I make a list of things to do every year, much like a resolution? I call it my 30-list cos I'm in my 30s. Can or not? Last time in my 20s, I did a list of things to do before I hit 30s. Now..a list of things to do before 40s? Hahahah..
Visit Greece,and apenad New Years Eve in Berlín and New York.. I have lots of places to visit on my bucket list. Some I had some of them are still there waiting in line. Remy, holiday list~ I like!